According to sources, the microphone found in the new iPad 3 and iPhone 4S both have the same accuracy, so the new iPad will not suffer from any problems due to having the microphone farther from the mouth when talking. The interface slides up from below the display with a clever animation. 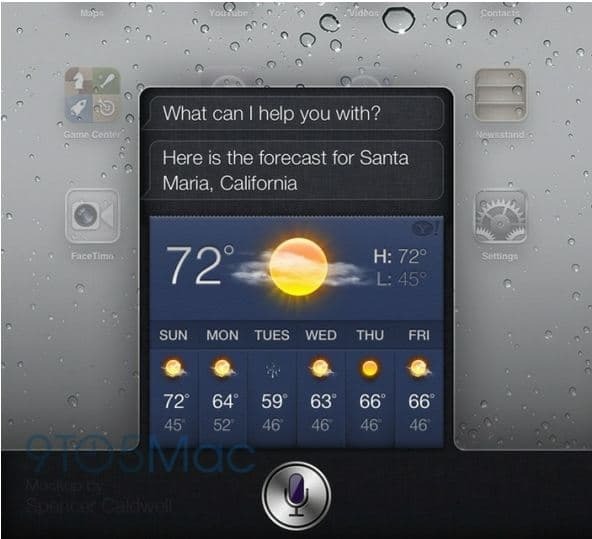 Siri is built into the iPad as a small window on top of whatever interface the user is currently interacting with. This Siri window with rounded corners sits at the bottom center of the display, as you can see in our mockup above. The Siri iPad interface takes very little space over the iPad interface currently in use, and is designed with the same linen texture as on the iPhone 4S. Siri for iPad also works from the lock screen.